Almost daily, there are stories about people being fired from their jobs because of stupid, inappropriate, obscene, racist, etc., etc., etc., posts they made on various social media platforms. In most cases, the action is appropriate given the nature of those posts. As you can see, the post garnered over a 1000 "likes" and retweets at that point. When school officials became aware of the tweet – only after those 1000 or so likes and retweets, they became concerned and told Ms. Nash to delete the offending tweet and not to continue that conversation on Twitter. A school official contacted the student, who indicated he was not offended by the exchange. For several hours that day Ms. Nash continued to tweet other school news and announcements, as was her job. A week later she was fired, in a four minute meeting. What are the HR issues here? 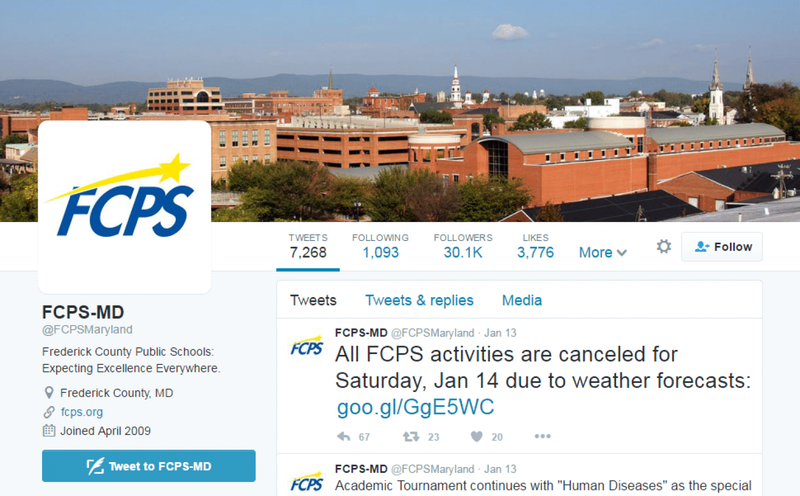 Did FCPS have a social media policy to guide its own social media coordinator? It appears not. Did school officials make clear they intended for her to stop tweeting altogether, or as was reported, to stop that particular conversation? It appears not. Did they follow (if they have one) their own disciplinary policy? Ms. Nash was fired for this one-time offense. What does their policy dictate? Only FCPS officials and Ms. Nash know this. Did they fire her because they didn’t like the content of the on-line conversation, or did they fire her for continuing to use Twitter that day (see above #2)? Did this Twitter exchange really put FCPS in a bad public light? Was anyone really injured by it? Was their response proportional? Seriously, did this one brief exchange really rise to the level of termination? Was the violation of rules (again, did they even have a policy/rule in place?) so serious as to warrant termination? I don’t think the school’s response was at all proportional to the "offense". Whether a classroom teacher or not, Ms. Nash works for a school system; in that sense, she’s an educator. Educators educate and correct. She corrected an error – in a lighthearted and almost innocuous way – albeit publically. She was also hired as social media coordinator, tasked with increasing engagement on social media. You don’t do that with boring, dry announcements. You engage. FCPS may feel fortunate that at least right now, Ms. Nash doesn’t seem inclined to fight this. Public opinion may change all that, but I don’t think FCPS is going to come out on top in the public opinion arena. The State of Kentucky just passed a right-to-work bill and Gov. Bevin will (or already has) sign it into law. Right-to-Work laws prohibit employees from being automatically enrolled, or forced to join, a union unless that employee has explicitly stated his/her desire to join. Such laws also prohibit forcing non-union employees to pay any union dues or "maintenance fees". Kentucky becomes the 27th state to pass a Right-to-Work law. Union membership continues to decline and is only largest in public sector employment (government). In 2015, only 11.1% of all U.S. workers, while it was 35.2% in the public sector. The figures for 2015 are virtually unchanged from those in 2014. This interactive map from NPR shows the decline over the past 50 years. We could probably count – and debate – all the reasons for this decline vigorously for quite some time. In the end, however, the facts are there. Fewer people are finding that being represented by a union is in their best interests. Recently, I wrote about very important issue that should be in everyone’s interest. How can we continue to actively support a movement that allows racist, discriminatory and abusive behavior to thrive? We shouldn’t. We also shouldn’t support a movement that abridges any other right. That was the gist of a recent Supreme Court Case related to those "agency" or "maintenance" fees non-union members are forced to pay. That case resulted in a tie vote which left the practice in place, but almost certainly will be revisited when the Supreme Court is again full force. In 1935 the National Labor Relations Act was signed into law granting American employees the right to organize and be represented by a union. It is far past the time when we should also grant American employees the right to choose NOT to be represented by a union they don’t feel benefits them, and not force them to financially support that union. A Right-to-Work bill has been presented to the Maryland General Assembly each year for at least the last six (?) and has never made it out of committee. Since Maryland is dominated by a Democrat-controlled legislature (although now with a Republican governor), I don’t see such a bill getting any play this year, either. Although in the furtherance of extending many rights to employees, I don’t understand why this right should be any different. And a look at what the feds might bring….. The Maryland General Assembly convenes on January 11, 2017. What can we expect from our elected officials this year in terms of employment law and workplace regulation? As in past years, it will most likely be more of the same, but the changed atmosphere could inject a bit more energy into the process. In Maryland, we have a Republican governor (who enjoys an unprecedented approval rating among all Marylanders) and a majority Democrat state legislature. They have butted heads already on several issues and will most likely continue to do so this year. I think it’s fair to say that the paid sick leave issue will take center stage in the employment-related arena (again) this year. Two bills have already been pre-filed that are repeats of the bill presented last year. It would require employers with 15 or more employees to provide paid sick leave at the rate of one hour for every thirty hours worked; employees working as little as 8 hours per week would qualify; Some of the provisions are that it would allow for carry-over of sick leave from one year to another and would require reinstatement of unused leave if an employee leaves that company and returns within a specified time period. Governor Hogan is set to present his own bill on sick leave. Sources say it would cover employers with 50 or more employees offer a tax incentive for smaller employers that offer comparable leave, will require five, not seven days of paid leave and will cover part time employees working 30 or more hours after they work for the employer for 120 days. Leave will have to roll over (at least 40 hours) but accrual can be capped at that point, does not have to be paid out at termination nor reinstated if the employee is rehired. At a legislative kick-off breakfast hosted by our local Chamber today, our delegation to the GA seemed to feel that Governor Hogan’s bill would not get any support from Democrats. Not terribly surprising. It’s also likely that another bill regulating scheduling practices will be presented again this year. Prior bills submitted on this subject have severely restricted an employer’s ability to manage staffing levels when employees call-out with little or no notice and even prevented businesses from hiring new employees (what?) without first offering additional hours to existing employees. The penalty for making changes to an employee’s schedule with less than 21 days’ notice would require the employer to pay "predictability" pay to employees. You can review last year’s landscape in my previous posts here and here. I expect many of these to return this year. On the federal front, we could see a fair amount of churn in that the Trump administration will likely nix several Executive Orders President Obama put into place, as well as instruct regulatory agencies to back down from other efforts. I think most will agree that the DOL’s new overtime rules are dead (even without the federal injunction). It’s also fairly sure that once new members are appointed to the National Labor Relations Board that several of the decisions made by the current board will be overturned – ranging from so-called "quickie election rule" to the joint employer standard, and of course, the many, many attacks on policies in employee handbooks. That will certainly be welcomed by many businesses (employers). While the CEO Pay Ratio is not a well-known issue to some, it is still alive (for now). Starting next year, the U.S. Securities and Exchange Commission (SEC) will require public companies to calculate how their chief executives' compensation compares with their workers' median pay and to disclose the so-called CEO pay ratio in proxy statements reporting on fiscal year 2017. The rule implements part of the Dodd-Frank Act, and many public companies are already working through the calculations involved. Will this survive the Trump Administration? With Andrew Puzder coming in as head of the DOL, there’s a good bet it won’t. However, be aware (or beware, as the case may be), many states or localities are considering or have passed their own laws in this area, including the city of Portland, Oregon. Of course, the elephant in the room is the Affordable Care Act (ACA) and if it will actually be fully repealed, partially repealed, or repealed and replaced and how it all might work. It’s hard to know how this will pan out. Actually, it’s hard to know how a lot of these issues, and many more, may pan out. What we all need to remember is that both sides (all sides?) are engaging in rhetoric that is designed to get us fired up. It’s what they do (along with the media). What we as business leaders, professionals, and citizens have to do is dig deeper and get as much information as is possible before deciding which "side" we’re on. Consult multiple sources for information – don’t just flow with the headlines or soundbites; educate yourselves and discover how all these things will really affect you, your business and your employees.